Some stories need villains. Many don’t, but some do. A villain clarifies things. He amplifies existing conflicts, heightens tensions, and, most importantly, moves the plot along. Generally speaking, protagonists are reactive. They respond to crises and threats, but they rarely instigate them. Antagonists, though, are allowed freedom. They aren’t defending anything; they’re working to change the status quo, and they’re allowed whatever means they deem necessary to achieve this. Not every story follows this rule, and the more character driven a plot becomes, the more difficult it is to distinguish between these two roles, but on a show like The Walking Dead, villains are crucial. Without a good villain, a genre show stalls, and heroes fall to petty bickering and tedium. Without a good villain, we're just waiting for something, anything to happen, turning what should be pleasure into a chore to endure between thrills. This season of TWD has been problematic, and I’m coming to believe many of its difficulties stem from the fact that there’s no clear bad guy. Oh sure, there are zombies, but once you get past the initial panic, zombies don’t really do much. They’re more a natural disaster than an autonomous threat, like living in an extreme climate, or on a fault line. You make what precautions you can, you try and keep yourself prepared, but that’s all you can do. Every once in a while, there’s an earthquake, and people die. Then you move on. It’s not a bad metaphor for life, but as the impetus behind a television series, it lacks a certain depth. Once you get past the fact that dead people are walking around and they want to eat you, there isn’t much else to explore. This isn’t a world where magic exists, with a variety of monsters and whole mythologies built up to deal with them. It’s a world where there are zombies, and everything else is basically the same. By now in the show’s run, the shock has worn off, and the ensemble (and the audience) needs more. That’s where the villain comes in. That’s what Shane should have been. In “Better Angels,” Shane finally steps up and goes from dangerous/creepy/occasionally murderous and rapey loose canon to out and out baddie, and while it doesn’t last very long (it’s hard to be evil when you’ve been gutted and shot in the head) his actions provide a clarity this show has so often lacked. The bottom half of TWD’s second season has been a series of slow but steady improvements. I had wondered if it was possible to make a TV series out of this mess, but I’m quite a bit more confident now, and I actually find myself looking forward with some eagerness to the third season. “Better Angels” is as good as we’ve seen so far this year, in terms of structure, visuals, and pay-off, and if some of its twists and turns aren’t quite as effective as they might have been, that’s more the fault of a scattershot season than it is any problem with the twists themselves. Most crucially, Shane finally makes a choice about where he stands, instead of just rubbing his head and sneering. Dale is still dead. 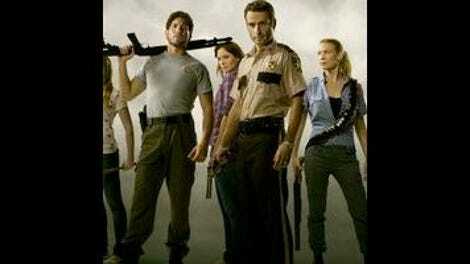 The episode opens with an arty montage of his funeral, combined with shots of Shane, Andrea, Daryl, and T-Dog going to town on a group of zombies out in a field. It’s an odd scene, but it helps set a tone, which isn’t something this show has always bothered to do. The hour is full of these sorts of touches, and while none of them are subtle, they provide texture and variety, and help enhance the intensity of what is, for much of the running time, just a bunch of scenes of people talking at each other and occasionally glaring. The Walking Dead needs these touches. It needs to use whatever tools it has to add color to its world. So far, the show’s biggest success in this regard has been its consistently clever zombies setpieces. No matter how bland or half-assed everything else is, the “walkers” have always managed to keep a certain edge, whether its from unexpected gore shots, or unusual staging choices. That’s a good start (and really, if you’re doing a show whose primary reason for existing is “zombies,” you better do justice to the damn things), but it’s not enough. The ability to generate a handful of clips each week that would look good on YouTube isn’t sufficient justification for a dramatic television series. “Better Angels” was striking throughout, however. Most importantly, more important even than the cool camera angles and memorable visuals (that last shot of the wave of zombies approaching Rick and Carl was terrific), the episode moved like it had a purpose. Probably the biggest complaint I’ve heard about this season is the molasses swamp of Hershel’s farm. Why are we still stuck here? Why has the show spent so much time arguing and repeating arguments with Hershel and his people, when there’s a whole wide world it could’ve been exploring? The thing is, the farm isn’t really the issue. It makes sense that Rick and the others would want to find someplace relatively secure to hold up; they aren’t looking explore the world, or even to find other survivors, just a safe spot to hole up and try and live their lives. Hershel’s place isn’t a fortress, but it’s far enough away from population centers that, with the appropriate precautions and attention, it could serve as home for a while. It’s not illogical that they’ve stayed; what’s hurt the show is that the writers have yet to come up with a good reason to make them leave, or, at the very least, make the choice to stick around in one place have consequences. Yes, the cast has lost a few lives, and yes, stopping has meant that tensions between the group have been allowed to fester. But these developments happened in fits and starts, with no rising sense of danger or impending doom. Too much of this season, and of the show in general, has felt like improvisation to kill time before the real drama hits, and that’s bad writing. Every scene needs to have a point to it, and that point needs to be more than just, “Huh, we haven’t heard from [blank] and T-Dog in a while, let’s throw them a few lines.” The Walking Dead doesn’t need to be about the slow moral decay of a man’s soul, or the corrupt nature of government institutions, but it does need to be about more than just dragging us forward to the next commercial break. There needs to be artistic intent, and that’s something we’ve been seeing more of lately, and it becomes especially clear in “Better Angels.” I couldn’t tell you exactly what the writers were trying to say by the end of the episode (make sure your kid has a gun? ), but it all cohered in a way that held my attention, and, in the last ten minutes or so, became legitimately riveting, enough to make me overlook a few implausibilities. Shane finally goes over the edge, and decides he has to take Rick out of the picture if he ever wants a shot at Lori. He’s been struggling with this for a while now, and, in a nice piece of irony, what finally forces his hand is Lori’s attempt to apologize for what had happened between them. While it’s a little hard to swallow this new Lori, suddenly so repentant after trying to convince her husband to murder Shane only a couple of episodes ago, I appreciate the attempt to humanize the character, and if you’re willing to accept some inconsistency (and if you aren’t, you’re going to have an awful time watching this show), I think it works. It sounds like an apology from someone who’s realized she was getting too caught up in her own head, someone who has finally accepted her own culpability in what happened, and is now ready to move on. It also makes sense that this would finally send Shane on the warpath. Before, he could tell himself Lori was just in denial about their feelings for each other, but now, she’s admitted that she did care for him, but it was only temporary, and that it’s over. It’s a fine line, but by being more direct with Shane, Lori gives him a much more believable sense of closure. She doesn’t want him dead, she isn’t demanding that the baby in her belly is Rick’s, she just wants everyone to get along again. And because Shane can’t handle that, because he needs her upset, he decides it’s time to finally make his move. It’s not that difficult to imagine how all of this might have played out if the build-up had been better handled. How Dale’s increasingly crazed warnings of Shane’s madness could’ve fallen on deaf ears, how Shane could’ve worked to keep the group at odds with each other while trying to undermine Rick’s self-confidence; how Dale’s death was all Shane would’ve really needed to try and pull a coup. That’s sort of what happened, but only when viewed in retrospect. It can be satisfying when a show pulls off a stealth storyline, when it keeps you in the dark right up until everything explodes, and its only then that you see all the bombs which had been carefully hidden over the course of the season. That’s not what happened here. But that doesn’t mean the explosion itself isn’t fun to watch, and the sequence in the woods, with Daryl and Glenn realizing that Randall had had his neck broken, while we watch Rick and Shane knowing that one man wants the other one dead, was well-constructed. This was an episode full of choices, and that’s good news. Choices drive drama, and watching everyone finally get to move into Hershel’s house, after so long hanging out on his front lawn, helped to clarify the situation, and give them something to fight for. As mentioned, Lori decides she’s screwed up, and, in making what has to be one of her most likable speeches this season, effectively dooms the person she’s apologizing to. Glenn and Andrea work on Dale’s RV, and while neither of them have any big shifts, it’s a fine way to say goodbye to a character, from the two people who spent the most time with him. 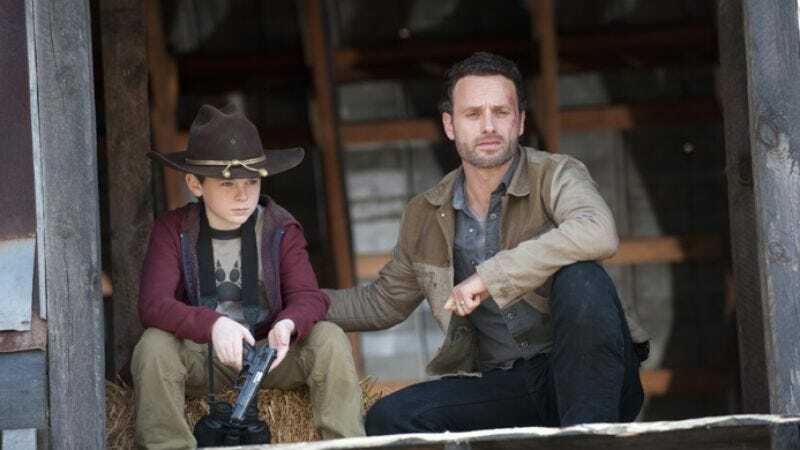 I’m not sure I entirely followed Rick and Shane’s conversation about Carl, mainly because Rick sounded like a tool, but at least that lead to Rick talking to his son about Dale’s death, about responsibility, and about guns. Shane chose to help Randall “escape,” before breaking his neck and using the kid’s absence to pull Rick away from the others. It’s not the best plan in the world—in fact, given where he leaves poor Randall (the only justification I can think of is that Shane hid the body, and didn’t expect the kid to come back from the dead), it’s a plan that had no hope of succeeding—but Shane has never been one of the world’s great thinkers. And that forces Rick to make one last choice, one which seemingly contradicts all his efforts at upholding the law. The Walking Dead is a show I have a hard time defending. I enjoy writing about it, and watching it (mostly), but it’s so often a case of frustrated potential and sloppiness that I wouldn’t ever recommend it to anyone else. Sometimes, I wonder if it’s just a lost cause, one of those shows that are doomed to shamble through airwaves, maintaining ratings more through inertia than any real craft. And yet I see enough glimpses of hope, scenes or even whole episodes that seem to have been lifted from another, smarter series—one which I would have no problem defending—and those moments keep me hooked. Moments like the end of “Better Angels,” in which Carl shoots zombie Shane, and, in doing so, wakes up a whole horde of walkers, all of whom immediately start homing in on the angst-ridden father and son. Yes, there are plotholes here, but it’s such a stark, immediate visual: Rick may have thought that stabbing Shane in the gut solved his problems, but here in the land of the zombies, problems have a way of getting back to their feet. And even if you gun them down, there’s always something else over the horizon, waiting, listening, and eager to feed. In regards to plotholes in that last scene: where the hell did Rick and Shane have their final confrontation? It can’t be that close to the house, since that would throw Shane’s whole plan out of whack, but it has to be close enough for Carl to wander over, and for the wave of zombies coming up the hill to serve as a threat both against Carl and Rick, and Hershel’s place. I’m not sure how Carl was able to find them as easily as he did, and I’m also astonished he’s that good of a shot. In case there was any question, this episode confirms it: when you die, you become a zombie, whether or not you were bit. That’s probably important. Three deaths in two weeks, and two of those deaths were major cast members. Way to make up for lost time, TWD. T-Dog has multiple lines this week! And some moderate character development. It’s almost like he actually exists. “The Governor called, you’re off the hook.” -T-Dog, demonstrating his latent psychic abilities.